My dad has been working hard to craft nutrient dense moderate protein meals. For a while he was pursuing ketosis with a higher amount of dietary fat and his Bulletproof teas with extra butter after I introduced him to Dave Asprey’s version of “intermittent fasting” . After an initial period of success he found he was putting on weight, becoming inflamed and his blood glucose levels were starting to drift back up. He then started to go for a slightly higher amount of protein in line with the concepts described in Volek and Phinney’s four phases of a ketogenic diet chart. That is, during weight loss some of the fat being burned each day should come from body fat. Hence his meals needed to focus on getting adequate protein to support muscle maintenance and obtain other necessary nutrients, while significantly reducing dietary fat. Once he did this he started losing weight and his ketones actually increased due to the body fat being burned. With adequate protein in place he then dialed down the dietary fat to the place that still comfortably satisfied hunger. From there he had some great results in terms of weight loss. 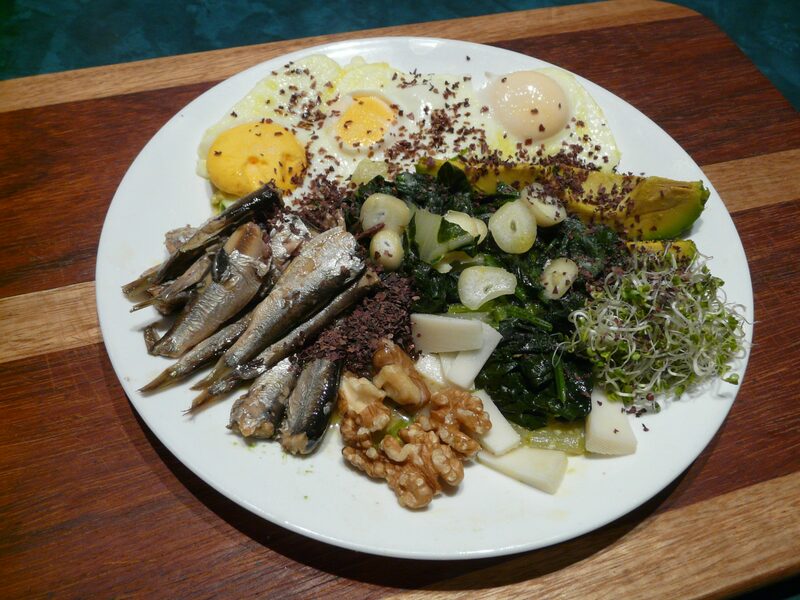 This meal of sardines, eggs, spinach, garlic, broccoli sprouts, avocado, goat cheese and a few walnuts is an example of one of those meals. The details are shown in the analysis below. As you can see it does well in terms of both the vitamins and minerals and the protein score. While there is not a lot of added fat in this meal (butter used for cooking) there is still 65% fat from whole foods. Just trying to do the math here with the adjust example. So if 180lbs trying to lose 1.7/wk then eat ~1,800 cals with macros of 10% carbs (which hopefully works out to ~45g a day), 40% protein, 50% fat? The rest of the 800cal expended is all fat from the beer gut? (assuming that one is actually expending 2,600 cals total which depends on MBR for your height and exercise). Whoops. Meant…. 10.45% carbs, 29.85% protein, 59.7% fat (can obviously round those). ? Marty, have his glucose levels also improved? Yeah. Definitely not gone up. Hi Amy, it’s Merv, Marty’s dad here… showing as Marty as I have editing access to the blog. My special interest has been reducing post prandial BGs after finding them remaining elevated all afternoon after lunch even though lab tests have shown 12hr fasting of around 5.1 or so. Now with controlled food intake my 12hr fasting averages around 4.5, ranging from 3.8-4.8. I’ve been doing 16:8 fasting for some time now with a very occasional 24hr. Checking through my log, 19OCT16 BGs shows a typical 8am @ 3.8 & 5pm @ 3.4 after 24hs still with good energy and mental clarity. I haven’t checked for some time now but there had been good improvement made with post-prandials… it seems that, for me at least, carb intolerance from life-long sugar addiction takes time to heal. Thanks for answering. I am experiencing similar results. By focusing more on protein and less on fat, my glucose is getting closer and closer to my target. Yeah. Lots of people find that. The insulin from the protein seems to pull down the glucose. Building more muscle tends to help metabolise the glucose which I think is critical.